This is not the first fake image tweeted by Sanjay Nirupam. 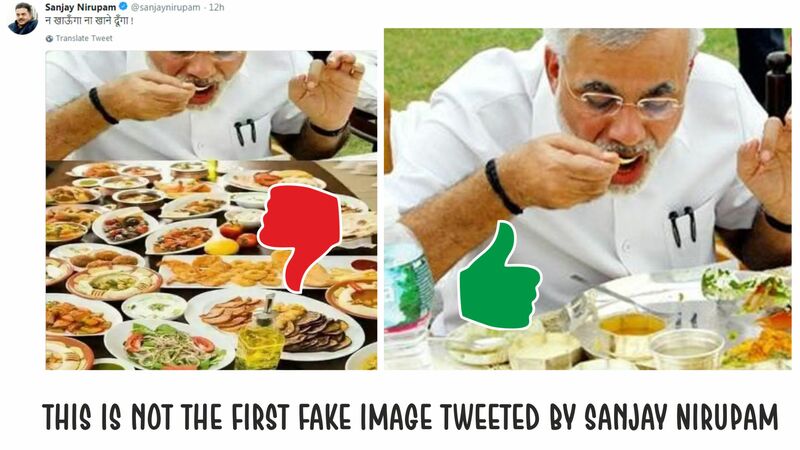 Sanjay Nirupam tweeted a photo of PM Narendra Modi eating from a plate while in front of him lies many dishes with a text “न खाऊँगा ना खाने दूँगा !”. PM Modi in Year 2014 said the same about corruption in his speech. which means “Neither will I eat, nor will I let anyone eat” meaning, Netiher will I take bribe or become corrupt, nor will I let any one do the same. Dear friends, I know it's photoshop. And I know Modiji doesn't eat this much. Take it as a joke. Don't be so serious all the time. Further, this is not the first time Sanjay Nirupam tweeted a fake photo, 2 years ago he tweeted a photoshopped photo showing RSS standing in a drill before a British Queen. Hail Photoshop! No, RSS is not Saluting British Queen. ← Did Rahul Gandhi use a photo of lake Rakshas Tal from Google ? When and where did a mob trash Traffic Police cops ! Is that Ambani’s photo in PM’s Office ? Hail Photoshop. Have you been eating poison ? Is Lays chips made of plastic ?